Om Shanti Om, as soon as you read the title, I bet like me, the music and the film immediately begins to play in your head. Directed by Farah Khan, the film starred Shah Rukh Khan, Arjun Rampal, Shreyas Talpade, Kirron Kher and introduced Deepika Padukone. If you can believe it, it has been 10 years since the magic of OSO hit the big screen. It is as Farah says, a movie, within a movie within a movie. 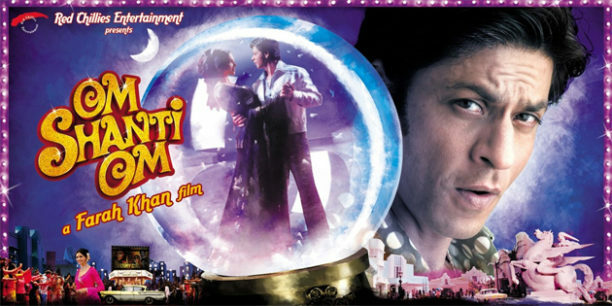 Set in the 70s and present day, Om Shanti Om has films, stars, sets, drama, dance, action, romance, revenge, reincarnation and finally Happys Endings. It is a movie that has it all and more! To set the stage check out the trailer that gives you a glimpse into the world of Om and Shantipriya. 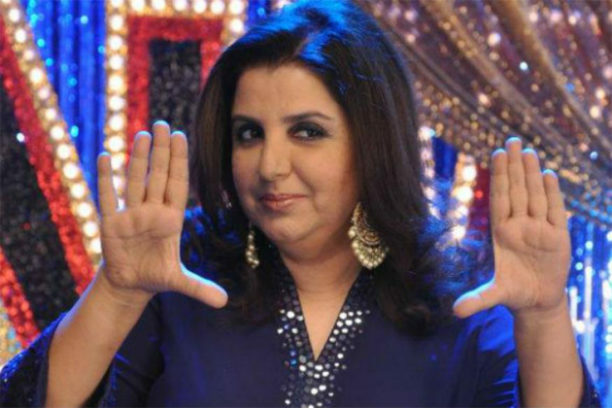 I was very lucky to be able to have an in-depth conversation with director Farah Khan about Om Shanti Om. From how quickly she wrote the script, to casting Deepika, to working with Shah Rukh and more, she gave us an inside look into the making of the film. It was an incredible and fun experience to talk with her about this amazing film. I know you are going to enjoy it! You know I feel like we shot it just some months ago. I was pregnant at that time and now I look at my kids and they are going to be 10 next February and I am like where has all this time gone? Not a day goes by that someone messages me saying we just saw it again on television and it is just fabulous. Every week, actually I get 5-6 messages from people who are just watching it again and loving it. You know Stacey, this actually was the script that came easiest to me. I actually wrote the screenplay in two weeks. Yes, this movie just came so easily to me. I think, because it is part of what my DNA is – being a part of Bollywood and loving it so much. From childhood from a family, an impoverished family, but still that only spoke about movies. All the legendary stories that we used to hear as children about actors and producers and what happened on set, catch phrases that we have been hearing – all of it. Om Shanti Om really was totally from an insider’s point of view. It is not something that many people know. It just came very easy to me. Before and after that I struggled to write a film, but this just flowed! Because was an ode to all the movies that I loved and watched. It was my ode to the movies. It is a movie, within a movie, within a movie. Of course, then there are all the layers, now when you think of it you feel oh this… but I didn’t go that deep into it. I just wrote it. It just came out. Sometimes the best things just come out the easiest. Looking back on it from writing that script, to filming, to the final product did it become everything you thought it would be? You know, we came with another big movie called Saawariya, which was Sanjay Leela Bhansali’s movie. I guess if we hadn’t come with that movie, we would have been the first film in the history of Bollywood to make 100 crores. We just fell short by 13 crores because that was what was Saawariya’s business at that time 10 years ago. We would probably be the first film that crossed the 100 crore benchmark. She reminded me of Hema Malini actually. She really did. For me, Shantipriya was based on her, on Hema Malini. She was this very dignified leading lady who is the perfect Indian beauty. I was very clear I didn’t want an established actress because I wanted the audience to think that this is Shantipriya. That not at any time should they think, oh this is Aishwarya Rai or this is Kareena Kapoor. They should believe that this girl is Shantipriya. I think taking a newcomer was a big risk, but it also was a calculated risk in that sense. For me, Deepika has this kind of a poise about her. I think she was just 21 when we started shooting and there was a poise beyond her years. Of course, she was not as good an actress as she has become now. I was literally had to look down, look up, okay turn your head slightly. So all the instructions were being given on the mike when she would act. But she had a star quality about her, which I noticed immediately. Especially when we did her photoshoot that I really noticed that. She just looked the part. She really is an all rounder. She looks beautiful, she can dance and now she of course has become a very good actress. I always say he is my muse. For me, it is the easiest thing and the most joyful thing to make a movie in which he is there. Because really when I am working with him I have no stress. We are just so much on the same plain. You know, how it is when you are so comfortable with that person that you can say what you want and you know it won’t be taken wrongly or badly? I don’t have to mind my P’s and Q’s. We have the same sense of humor, which actually is so much politically incorrect that we both have to be careful now in today’s time (laughs). 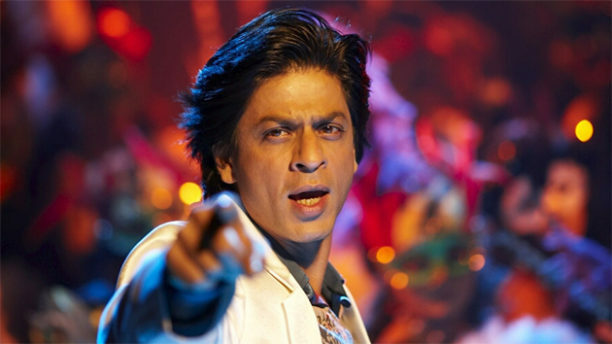 If you see the making of any of my movies Main Hoon Na, Om Shanti Om and Happy New Year, you see the ease. He is a fabulous producer. He has kind of spoiled me for anybody else, which is why I would rather wait and make a movie with him than run around trying. He just spoils you. It is very difficult then to go work with somebody else. He forces me to spend more money, do this, do that… You know, it is so special that there is somebody backing you at all times, never questions what you are doing, why you are doing it. He never asked me why are you taking a new girl. He never had any issues. He said, “Okay if you think you are confident of her just go ahead.” That kind of support gives you confidence but also it puts me in a spot of great responsibility. I always feel like a teacher’s pet who has to please their teacher and make sure the movie makes money. You know they weren’t so great then, by the way, they actually were fairly new music composers. They have just done a couple of movies and had not had a big hit as yet. And they created such an incredible soundtrack. I mean even today when there is an award function or there is an opening, they always play the ‘Deewangi’ song, because it is just so full of fanfare and opulence. I like all the songs, of course, but my favorite tracks are the love songs, especially the one that plays in the background, the ‘Aankhon Mein Teri’, ‘Ajab Si Ajab Si’ (yes, she sang it and I did too under my breath!). I love that. I love the ‘Om Shanti Om Theme’. Actually the song, that really didn’t become popular, but one I love, is the song he plays right at the end where he enacts the whole drama of the movie (‘Dastaan E Om Shanti Om’). That one was so incredible. It always gives me goosebumps. Like I am talking to you right now and I am getting goose bumps. The more popular tracks are of course ‘Dhoom Taana’, ‘Deewangi Deewangi’ and all. But these are the ones that came from our souls! Any changes to the film? No, not really though I was never really happy with the set of ‘Deewangi Deewangi’. It started out to be a big set, then it became a small set and there was no time to change it. I was shooting such a big song and we have such a small set, so maybe I would make that set a little more opulent to match the rest of the movie. You know, Stacey, I have been asked so many times, but I don’t think so, I think the story just ended where it had to. I can’t think of how to take it further. How to better it. If it comes organically from within me. Like a Happy New Year can have a sequel, Main Hoon Na can have a sequel, but for me Om Shanti Om was so complete in itself that I don’t know how to take the story and better it. It is so wonderful. You know, I couldn’t go anywhere because I was pregnant and they took the film to the Berlin Film Festival. Shah Rukh called me from there and said you have to see how the audience is reacting. The entire festival jury and the audiences are in the aisles dancing in the last number! It was a joyous film and it still is and that’s amazing. Sometimes I want to tell the critics you don’t want every film to be dull and boring, but the joy a movie can give to people – that high is something else. I think that for me, is the best part, that it still continues to give that joy. Everyone here just loved the entertainment and the drama of the movie and you know, for a lot of non-Indians Om Shanti Om was their introduction to Bollywood. Actually this should go to Broadway. See, I got the idea when I was doing Bombay Dreams, which was on Broadway and West End. My idea was that script was really crappy and I thought if ever I would do a show and a script had to be written it should be this…So the germ of the idea came from Bombay Dreams, which was about a slum boy who becomes a big star. That never, ever, ever really happens. I thought the only way a slum boy would become a star is if he was reincarnated into a big Bollywood star. And that is how it started – it was the germ from there. This is a movie that is begging to go to Broadway. It was really befitting that it became a Japanese musical because they didn’t know it was going to be 10 years. They just loved the movie in Japan. It is still playing in Japan, it released in 2014. It has been 3 years and the film is still running in the theater in Japan. They just took to the movie. How was it to see Om Shanti Om come alive on stage? It was so surreal. I cannot tell you. You know the Japanese are very staid, unemotional kind of people and they were up on their seats and they were clapping and singing. The joy that it continues giving is, for me, that is the best part. You wonder, what would the Japanese find interesting in this but like I said, they were singing the songs and they were dancing in the theater. I think what they really loved is the story. Actually when the movie released, this is what the distributor told me: he said he bought it because they just love the theme of reincarnation, that this life is not the end of it. He says it gives us hope. His son died in the Osaka earthquake. For him, it was a very emotional connect to somehow think that people are reborn and life continues. This is something that we just take for granted and we never think so deeply about it. It touched them in a very different way. Changed as a director since Om Shanti Om? I don’t know if I have become more patient or what. I don’t know. I feel I have, but people tell me I have not. There was a lot of innocence in the way we shot the movie. There was no second-guessing – it was just all out there. I guess now in today’s cinema, I would think twice about being so out there. You think, oh the audience will think it is too in your face, but at that time 10 years ago; it was so in your face, unapologetically so. When you did the drama in the Om Shanti Om, the emotional scenes, it was, for us, all very real, even though it was in that highly elevated space. It was within the world of the film. I was reading an interview with Arjun Rampal and he said, he was talking about how directors know their job and he said, when I came on Om Shanti Om I was really trying to underplay it and Farah came to me and said, listen I will be having earth shattering background music happening over here, there will be sound effects. Everybody’s pitch is on a higher level. You have to match it. You can’t be doing a separate film. You have to have the whole picture in your mind and only the director has that. At least most directors should have that. That is a quality [in your face emotionally, unapologetically so] I would like to maintain but as cinema grows and as everybody becomes a critic, and as audiences change, it’s difficult to hold on to that. You try to. I guess you have to try being a little more subtle. Probably the next movie I shoot it will be more subtle. Like my husband tells me, you just make a serious movie and everyone will think it is a spoof. I was like that is really mean! My only fear is to not bore the audiences. My thing is at all times, no matter what, even if it is an emotional scene, they should be gripped and not looking at their phones. Never give them a moment to look away from the screen. I feel when they talk about women directors and all and how there is a lack – I want to say that I don’t think that audience cares if you are a man or a woman. They are involved in your movie. Every time they ask me ‘As a woman director…’ I always say I hate that phrase, why should it be a woman director? You never say it is a man director. Right? So why should you discriminate? Is it a handicap or what that you have to describe it such? It is not a job that is defined by gender. However, it does kind of break the glass ceiling when a film makes so much money and then you realize oh a woman made it. It also helps other girls make movies and get those kinds of budgets. You can’t say oh women don’t make movies that make any money. It sets a precedent that it doesn’t matter if a movie is good then people will watch it and it will make that kind of money. How have Hindi films changed since then? You know, it has been 10 years and they keep saying audiences have changed and no more song and dance. In a way, that is sad because that is really what makes our cinema so loved around the globe. Right? It is our music and our song and dance and like I said our unapologetic emotions! I think once you let that happen, that there is no more song and dance, I think Hollywood is going to take over, which is already happening here. A lot of Hollywood movies are doing far better than the Indian releases. Also now we have got access to Netflix, Amazon and all sorts of YouTube and everything. That was not there 10 years ago. So we are rather spoiled for taste, right? For me, it would take a lot for me to go out of my house and go to the theater, and buy an expensive ticket and wait for the movie to start. So I think like in Hollywood, what is happening here also, is people will only get up and go if there is a big event film coming. It is expensive to take your whole family to the theater. So right now, as we speak, it is the big event, entertaining movies that are really raking in the money. Of course, there are a some small content driven films that do well for their budget but they don’t go beyond a 35- 50 crore mark max, which is good for them because they made it in maybe 10-15 crores. But they are not transcending or the numbers going as high as the big event movies. Everybody is a critic, everyone who has a phone or a Twitter account. They love to run down the big movies and the entertainment because if it is entertaining then oh it can’t be any good. That is a very dangerous part of it. Another film coming up or in the planning stages? I think I need to start writing again! I need to. I will get into it from maybe mid-November! Lastly a message to those who have not seen Om Shanti Om. I would say to the ones that haven’t seen it, it really is the quintessential Bollywood film. This is the one for you. See it with your hearts. Don’t over analyze it too much. Just sit and enjoy yourself for 2-3 hours. That I can assure you will happen. It truly is a joy to watch and one of my favorite movies! I would like to thank Farah for the fabulous conversation on all things Om Shanti Om. I look forward to what she will bring to the big screen next! Now excuse me while I go watch it again…Om Shanti Ommmmm!